I don’t often — if ever — do this. But this blog post from L.L. over at I’m on my way — destination hell, deserves a good, close read in the wake of @tombrodbeck’s great, great story about Air Canada and the perception of crime downtown. I drive past the drinking spots like the Garrick Hotel and the one that used to be Bleachers (it’s called something else now, I believe) and watch streams of people outside, smoking and fighting and screaming. I have no idea how these businesses are allowed to operate when all they do with their liquor license is create a dangerous, violent atmosphere for the people of downtown, but it happens. It’s because of places like these hotels, plus the St. Regis, and the earlier mentioned Manitoba Housing complex that I can’t actually walk around those streets to get anywhere. If I want to go to my bank in Winnipeg Square, I have to do it during the week, when I have a co-worker with me. I can’t go on my own time because I am not safe when those are the establishments I have to walk near to get to my destination. Second most interesting is how the post relays an actual account of life lived downtown outside (and sometimes in) office hours by regular folk, their perceptions and observations. You know when CTV national news leads with the story in a newscast, it’s a big deal. We should all be mindful of that as the spin doctors get to work trying to clean up the fallout. I’d also like to point out, in reference, a story I did in early 2009 that echoes many of the credible points LL makes. 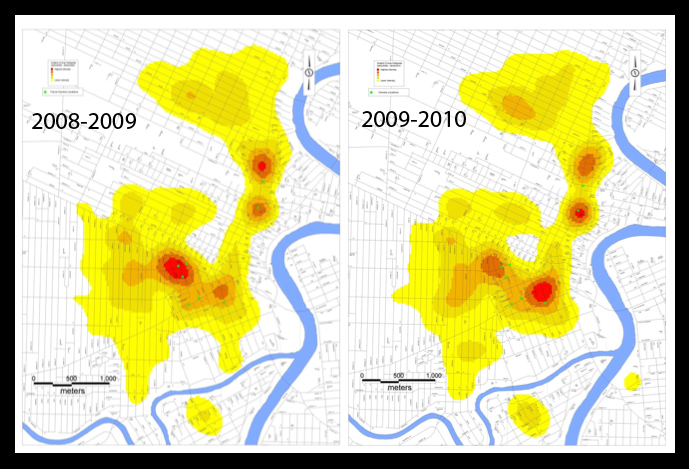 I’d also reference a recent post here that graphically shows what DT is up against, crime-wise. That was nearly three years ago. Has anything changed? I’d say yes, but only to a limited degree. Houston, we have a (social) problem on our hands. But doesn’t this prove the Air Canada memo is nonsense? I don’t think anyone is denying that downtown has crime concerns (well, except maybe for Stefano), and you and LL are right about the problems with certain establishments. However, the memo indicated that: 1) things have made some sort of dramatic turn for the worse recently; and 2) that downturn is the result of 1,000 “displaced people” making temporary residence in the downtown. As you’ve pointed out, these problems have existed for years. It’s fair to voice concerns about downtown safety. But saying that “1,000 drunk Aboriginals” (Air Canada’s paraphrased ignorant words) are turning downtown into a “bloody cesspool” (Brodbeck’s ignorant words) is, well, ignorant. PF: It does raise some interesting questions — My gut tells me there must have been a recent serious incident that ‘broke the camel’s back’ that the cops didn’t disclose to the public, for whatever reason. What it has to do with 1,000 “displaced people” I dunno, and would be worth watching to see how AC responds to that this week.